Mary Kay's New Summer Shades Review - Lipsticks, Glosses and Cream Shadows! Mary Kay launched some fresh summer shades this August and I was lucky enough to receive some goodies to try out. With the Australian summer literally just around the corner, these colours will definitely brighten your day. Once thing for sure, the colour orange is in this season.. and pineapples, did everyone see all the paper pineapples hanging from the ceiling at Myer and printed on tops? Moisturising. This lipstick is living up to it's expectations, once applied, my cracked lips felt smooth and plump, however, after approximately 1-2 hours, it will start dry out a little.. so make sure you apply generous coats of your favourite lip balm as a base. Lasts for up to 5-6 hours. I do a lot of talking, eating and drinking at work, the colour started to fade at approximately 5-6 hours. A tint was still visible - I do however, prefer this to true colour. No fragrance, but there is a scent. The usual lipstick scent, but sweeter. High shine. Evident from the swatches/applications, this again, be a pro to some and con to others. Pigmented. Very pigmented glosses, more pigmented than the lipsticks I'd say. You can wear these colours on it's own without a lipstick undercoat coat. Non-sticky. 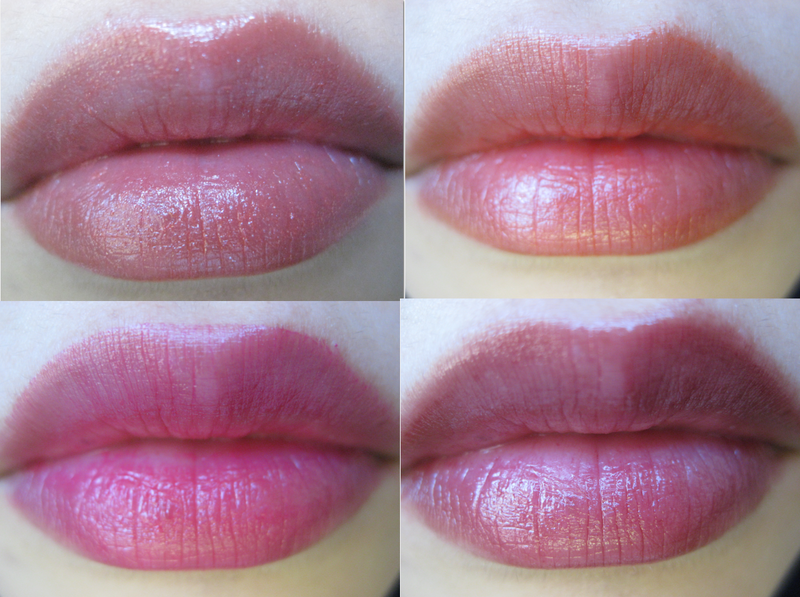 I hate sticky glosses, which is why I never go near Lancome's Juicy Tubes. 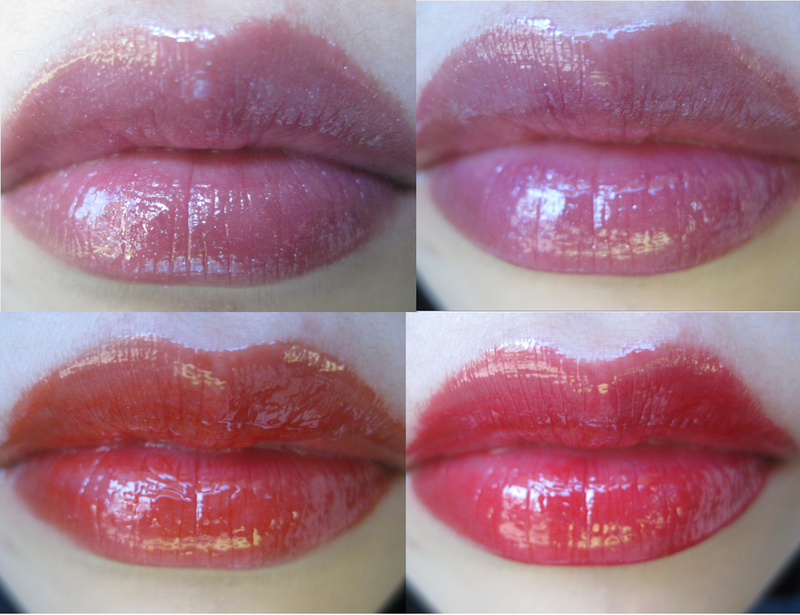 These glosses are not sticky per say, but you will get the occasional hair sticking to your lips on a windy day. Moisturising. If a gloss dries your lips, then it's probably a poor quality product. I am quite happy with the way this gloss sits on my lips. - Dries quickly and does not transfer. Lightweight and Easy to apply. This doesn't drag on my lids like some of the cheaper cream shadows I've tried. Long wearing and does not crease. This is long wearing alright... after a long day at work (say 9-10 hours) my cream shadow did not budge or crease. This lasts longer than Shiseido's cream shadows. Waterproof. You won't be able to wash this off under lukewarm water like usual cream shadows, it was difficult to remove even with a cleansing wipes. You need a good strong makeup remover. This is great for people who are looking for long lasting wearable colours. Wearable colours. 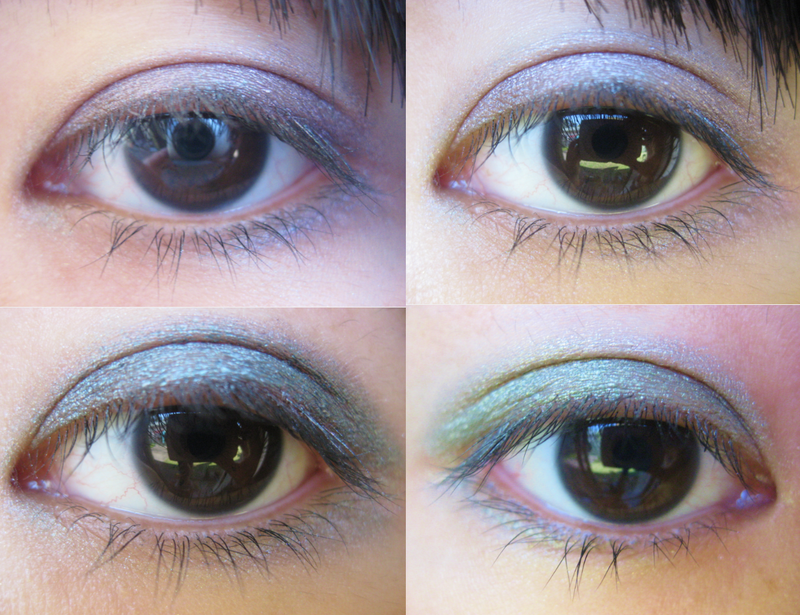 I don't usually wear a lot of blues and greens on my lids, however these colours are quite subtle and wearable. Fast Drying/Funny texture. This baby dries in an instant. I would probably recommend a brush for application so it doesn't stain your fingers. Once it's dries, it literally hugs your skin. The texture felt a little bit like... a light coat of paint? I love the long lasting effect and the anti crease technology, but I can't say I'm a big fan of the texture once it dries. Above are some tools to go along with the MK products. 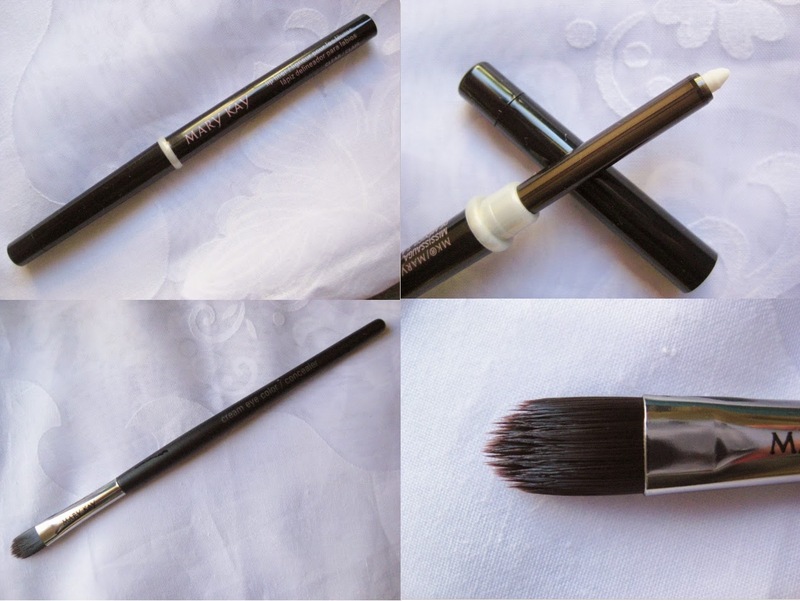 The MK Brush is perfect for applying the cream shadows. It'll pick up the right amount of product and provides precision when applying colour to your bottom lash lines. The MK Clear Lipliner is a great innovative liner designed to protect and prevent your lipsticks (especially the darker shades) from feathering or bleeding. 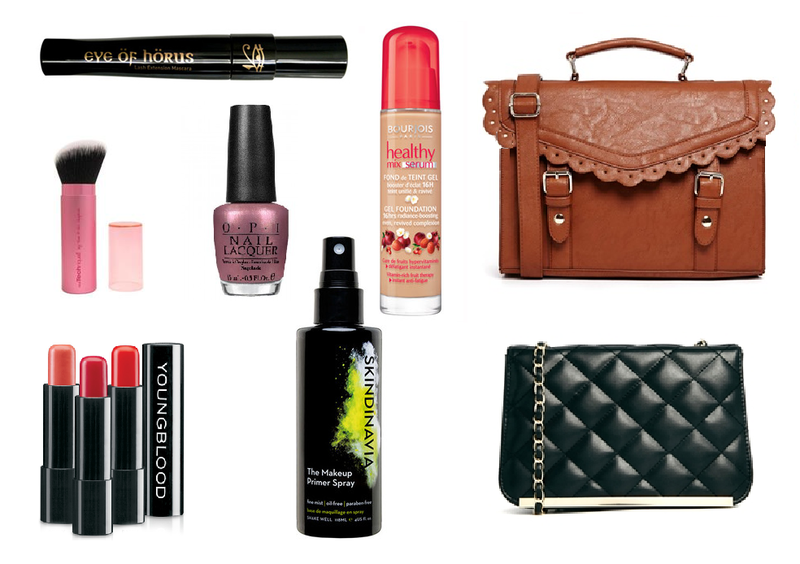 Which MK product caught your eyes? Don't forget to follow me on Instagram! Even though it's almost been a month since my birthday, I've been posting up annual birthday posts to help my poor brain remember exactly what I did each year. This year we went to Sealife and Fort Denison. First off... some pictures I took from Sealife Aquarium, look at those jellyfish! There's me at the rock pool. And below, some tasty treats from Sealife. Battered calamari, fish and sweet potato chips. Basically a historical site with a nice restaurant over looking the harbour. You can reach Fort D by boat from Circular Quay. "Fort Denison is a former penal site and defensive facility occupying a small island located north-east of the Royal Botanic Gardens and about one kilometre east of the Opera House in Sydney Harbour, New South Wales, Australia." What did you do for your last birthday? "What do you want for your birthday? You're so hard to buy for!" "A house and a new car, maybe a Euro holiday"
I received an Eye of Horus eyeliner from one of the Bellaboxes a while back, I was amazed by the pigmentation and quality. I have seen a variety of positive reviews and amazing before and after shots with this mascara. Real Techniques is another brands I've came across on various beauty blogs but haven't had a chance to put it to the test. I do need a retractable all rounder brush for the holiday seasons. Are you as lazy as me when it comes to priming? My mornings are short (See my everyday work makeup breakdown post). Adding another product means adding more time.. which is why I thought this primer spray was an excellent idea. Has anyone actually tried a primer spray? Thoughts? This polish caught my eyes, I thought it was a very pretty eerie and mysterious purple. In addition, I have never tried OPI - this is sad, right? Young Blood is one of those brands I've been curious about. The name itself is intriguing enough - maybe I've been watching too much True Blood and Game of Thrones. I've also seen Young Blood products at my local salon, a very luxurious display! This foundation has been on my wishlist for a very long time. I have a variety of foundations at home and I promised myself that I will not purchase a new foundation until I've gone through my current stash. Having a wishlist is fun, however, I often have disagreements with my bank account when it comes to making the purchase. Now that I am a responsible adult, I need to pay expenses and understand the value of money, I shriek a little during birthday months - especially my mum's. Mum expects a lot of clothes, shoes, bags and beauty products. Since I work full time and don't have a lot of time to go in stores to shop around, I would often spend half my pay on her presents, which is why I started using a lot of coupons and online deals. I even tried to pressure my boyfriend into buying an online coupon as a part of my birthday present! I remember when a friend asked what my favourite store was, I told her a store with everything in it, well this concept applies across both stores and websites. What's on your wishlist? Are you an online deal hunter like me or do you bite the bullet and pay full price in stores? YOU NEED SUNGLASSES FROM QUAY AUSTRALIA ASAP!